Have You Tried a Matcha Shot? Summary: Looking for a way to get a quick boost of energy without having to deal with caffeine jitters? Try a matcha shot. Looking for a way to get a quick boost of energy without having to deal with caffeine jitters? Try a matcha shot. Don’t know what a matcha shot is? A matcha shot is a yummy, good-for-you, quick little drink that you can put down in the morning as you’re leaving for work or in the afternoon when you need a pick-me-up. It’s a bright green, delicious burst of goodness that’s easy to whip up on the spot or pre-make so that you can bring with you wherever you go. Matcha shots are even perfect for evenings when you need something to help you stay focused. Mix one up to stay awake just a little longer if you have chores to finish or when there’s just one more chapter of your book to get through. Matcha shots don’t leave you wired or unable to rest. They simply help you stay alert, energized, and feeling good. The main ingredient in a matcha shot is always the same. You’ll use 1 teaspoon of matcha green tea powder, 1/2 cup of a vegan liquid (we love organic almond milk or pure coconut water), and a little sweetener or other flavoring if you like. You’ll combine everything in a shakable cup, and then pour your energizing drink into a little shot glass or sip it straight out of the cup. When you drink matcha green tea, you ingest the entire tea leaf, not just the steeped water from a tea plant. This means that you get 100% of the nutrients of the matcha leaf instead of a portion of the vitamins and minerals that have been infused into your hot water. Because you consume the whole tea leaf when you drink matcha, you give your body an extremely potent concentration of antioxidants in one serving (none of the important compounds in the tea leaf are diluted in water or thrown out after brewing). Drinking matcha actually offers the body 137 times the amount of antioxidants of regular steeped green tea! Matcha green tea powder has an antioxidant profile that’s stronger than nearly any plant on earth, which is huge reason why you should be drinking it. But, it offers even more benefits that make it possibly the top super food in the world. 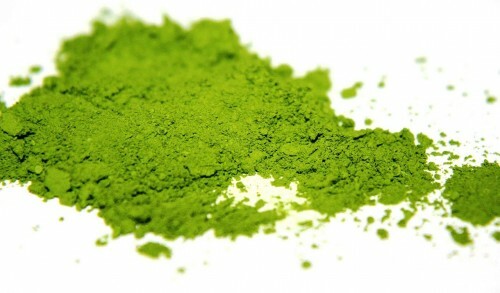 Matcha green tea powder is full of fiber, vitamin C, chromium, magnesium, zinc, selenium, and even chlorophyll. You’re getting an abundance of these nutrients with matcha because you’re consuming the whole nourishing tea leaf.